Synopsis: A moving story of a woman with early onset Alzheimer’s disease, now a major Academy Award-winning film starring Julianne Moore and Kristen Stewart. Alice Howland is proud of the life she worked so hard to build. At fifty, she’s a cognitive psychology professor at Harvard and a renowned expert in linguistics, with a successful husband and three grown children. When she begins to grow forgetful and disoriented, she dismisses it for as long as she can until a tragic diagnosis changes her life – and her relationship with her family and the world around her – for ever. Unable to care for herself, Alice struggles to find meaning and purpose as her concept of self gradually slips away. But Alice is a remarkable woman, and her family learn more about her and each other in their quest to hold on to the Alice they know. Her memory hanging by a frayed thread, she is living in the moment, living for each day. But she is still Alice. This book is beautiful. It is heart breaking, but beautiful. I’ve not read a book with a character diagnosed with Alzheimer’s before but Genova did an absolutely incredible job with this book. It is clear that she is extremely knowledgeable about the disease and this turned out to be so much more than a piece of fiction. Alice is an independent, exceptionally intelligent, inspirational and powerful woman at the beginning of this story. She is a top professor at Harvard, as is her husband John, and the mother to three grown children. She is only in her early fifties when she is diagnosed with early onset Alzheimer’s and this absolutely terrified me. We are learning more about Alzheimer’s as more people openly talk about this terrible disease publicly but I still didn’t know enough to truly understand just how cruel this disease is. This novel succeeded in being a very informative piece of literature as well as a beautiful and poignant story. It terrifies me seeing how quickly Alice’s entire world changed once she was diagnosed. To go from being such a strong and intelligent woman to somebody who is unable to function without help is unthinkable. What made this novel so raw and emotional to me was that Genova very cleverly used her own language to reflect how the disease effects the whole family. We see Alice’s children struggle over whether to get genetic testing and how this will effect their own futures; John struggles to come to terms with losing his wife despite her physically still being his Alice. It’s really heartbreaking. I think what I loved most about this book is the sheer brilliance of Genova’s writing. As Alice’s mind and memory deteriorate, Genova very cleverly manipulates her language to place us in Alice’s shoes. Especially towards the end of the book when Alice is struggling regularly to recognise those around her and the names of objects in her surroundings. I almost felt that my own mind was being tested and reassured as I went along. Alice refers to ‘the actress’ but I’m still able to recognise that as her daughter, Lydia. A relief to my mind, sure enough, but a very harsh reminder of the reality of living with Alzheimer’s. There’s no cure and eventually those suffering with this terrible disease will forget not only those around them but also themselves. A beautiful, poignant and important read. I would recommend this to every book lover out there. But do get the tissues ready! If you get the chance, I also recommend watching the movie version. Julianne Moore is absolute stunning as Alice. 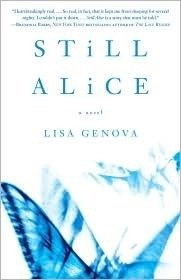 Have you read or watched Still Alice? What did you think? Love your review – this is still on my tbr! Terrific review – all of Genova’s stories are amazing and tell a fictional tale in a way that shares important information about neurologic diseases. Thank you! This was my first Genova book but I definitely am interested in reading more by her. Which ones would you recommend? All of them! Inside the O’Briens is about a family impacted by Huntingtons, Left Neglected related to an acquired brain injury and Love Anthony is about a boy with autism. She does such a great job blending fiction with the realities of these health impacts. I’ve had this book sitting on my shelf for far too long! Lovely review. My Mom works in a nursing home, so she interacts with Alzheimer’s patients on a daily basis. It is heartbreaking. It is such an emotional read. I definitely recommend having tissues nearby! It’s a wonderful book.